David Booth’s interesting stretch routine, Mike Babcock’s assistants, Canucks wanting to fix blueline, David Clarkson versus Matt Beleskey, Flames trade targets, teams in Cap trouble, Leon Draisaitl, Peter Chiarelli, free agency, the NHL draft and more in this week’s Roundup brought to you by Draftkings. 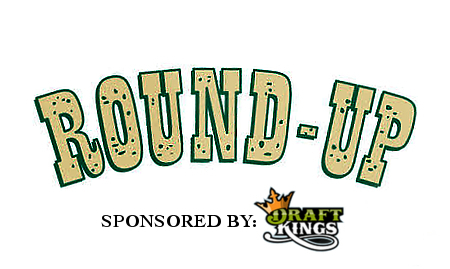 In the roundup we go around the Nation Network and give you some of the best articles of the last couple weeks. Every once in a while it’s good to know what other teams are doing, or maybe you find an interesting article you wouldn’t have found otherwise. What to do with Ladislav Smid? Do they Flames need to get bigger? Sean Monahan, with not much fanfare, just scored 31 goals this season, more than Taylor Hall’s career best. While being known as a big-bodied two-way centre. His left winger tied or beat every Oilers player in every major statistical category. And is a rookie. His other winger led the NHL in even-strength scoring. I guess by the awkward silence here nobody cares what you think!